A few years ago we moved house and although we didn’t move too far away, we found a real difference in the hardness of the water in the village where we now live. Taps started breaking within 2 years of moving and we noticed our hair and skin was overly dry. Having recognised the source of the problem we decided to invest in a water purifier. Immediately, I noticed my hair was no longer dry and frizzy, and skin was no longer flaking or itchy. I had tried different hair and skin products to fix the problem but the source of the issue was in the water. The very thing that I was washing in. When our lives start to break down in areas we perhaps try to deal with the symptoms and not the source of the problem. The Bible tells us that we are cleansed by the word of God. 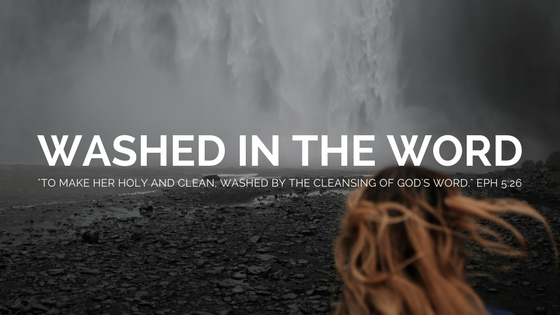 It washes us. It’s pure, it’s powerful, it heals and corrects. It aligns us, it lights our path, it comforts and directs us. What are you allowing to wash over you? Gossip? Problems? Worry? Are you perhaps impacted by soap operas or celebrities? You’d be surprised how much influence they can have on our lives when we are consumed by story lines, bad language, their lifestyles and looks. I used to be an avid fan of the Australian soap “neighbours” growing up back in the late 80s and early 90s. If I missed an episode I was devastated. Of course there was no “watch on demand” and we didn’t own a video recorder until much later. I remember, the soap not only impacted the way I looked (really bad perm), but I even picked up an Aussie accent! I know this is minor but I want to demonstrate that when we are immersed in something, when it washes over us, it impacts us in ways we don’t realise. I remember someone once telling me she had to stop watching Gordon Ramsey on TV because she found his swearing would stick in her head. Now, I’m not saying not to watch TV, read magazines or follow celebs on social media, but we need to be careful and watchful to recognise what we allow to wash over us and more importantly let God’s word wash over us. It’s the solution to every break down within life. I’ve mentioned before that I often head out for a walk listening to the Bible in my headphones. The YouVersion app is such a blessing to the body of Christ. It’s free and packed full of different versions of the Bible which you can not only read but listen to. I have found it so impactful! I understand that some don’t enjoy reading or perhaps find if difficult to read due to dyslexia, but there are so many different ways to let God’s word wash you. There’s no excuse. So just like the filter on my shower purifying the water I wash in, choose to immerse yourself in the purifying, cleansing word of God. Another amazing blog … thank you for making the time.